Eleuthera’s beaches spoiled me as a kid…I just didn’t know it. I guess it’s similar to the girl in my grade school carpool group whose mother picked us up once a week in her Rolls Royce. I once commented to her that it was a fancy car and she looked at me with surprise; I guess she’d never thought about her Mom’s car that way. That’s how I was with Eleuthera’s beaches. I just assumed that all beaches everywhere were long and predominantly empty with powdery pink sand and a cornucopia of treasures waiting to be found. As I grew up and traveled to other destinations I looked in vain for duplicate beach experiences. It is now as an adult that I know how unique Eleuthera’s beaches are, and I cherish them. As I walked two dramatically different beaches today I thought about what it is that makes these beaches special. Eleuthera is a hundred mile long, skinny island in the Bahamas. On one side the calm turquoise Caribbean sea laps at her shores. The other side of the island plays host to the deep blue open Atlantic ocean with its waves and white caps and fish-filled reefs. The Caribbean side doesn’t have as many beaches, and those it does have are shorter and the sand feels coarser, although I suspect that’s because there are so many shells that haven’t completely broken up because of the gentler water. Turtle (the dog) and I started our dual beach day with a visit to Ten Bay. This is where my brother and I paddled our little inflatable raft around when I was ten. Our house for the summer, the Blue House, was the only house there at the time, and we were definitely the only people–ever–in the bay or on the beach. Today there are a dozen or more houses ringing the bay. Turtle and I were alone on the beach when we got there, but shortly thereafter we were joined by two families and a single Bahamian man. The Caribbean side has different tides than the Atlantic side. This was the primary reason we went to Ten Bay–it was low tide there. I am more used to the Atlantic side so I am conditioned to walking the beach at low tide. Low tide yields firm sand and more shells. Unfortunately on the Caribbean side, at least at Ten Bay, low tide wasn’t such a boon. Low tide there meant we could walk out 100 yards or more with the water never reaching my swim suit. Even Turtle didn’t have to swim. The water was warm because it was so shallow. The day was hot and the mosquitoes were biting even in the water. We walked the beach from one end to the other. It was mushy and most of the way we were on a sandbar of sorts that emerged once the tide receded. I found a cute little starfish the size of a quarter and moved him to deeper water so he could grow to be a big starfish. All in all Turtle and I had an ok time at Ten Bay, but I didn’t have the magical experience that walks on “my” beach render. So we packed up and went back home so I could try to figure out what makes those Atlantic beaches so special. There are many great beaches on the Atlantic side. The crashing waves grind up coral and shells and produce a very fine sand with flecks of pink. The beaches wind for miles, punctuated by sharp greyish coral that you can’t cross barefoot. I walk down the path to the beach and am confronted with two choices: go left and walk to the rocks and back for a total of two and a half miles, or go right and walk two miles. For some reason I like going left more and that’s what Turtle and I did today. I get lost in my mind walking the beach. I suppose it’s similar to what runners feel. I can think of nothing or I can focus on a problem and often find the solution. The colors are so vivid–the different blue shades of the water and the sky, the gold and pink and white of the sand, the varying shades of green of the palmettos and dune grasses. It is a visual cacophony that dances and shimmers. The sound of the waves and call of the birds is mesmerizing. The smells range from salty to fishy, sweet grass to pungent decay. Every sense has its circus. The sand is peppered with wanna-be treasures and real treasures. The difference lies in the eye of the beholder. Of course the shells are no-brainers. Almost anyone will pick up a sand dollar or a little conch shell that’s perfect and unbroken. After that it all depends on what you’re looking for, or perhaps more appropriately, what you’re open to finding. When I was younger my Holy Grail were glass fishing floats. I was born slightly too late to find them; Bahamians would tell me stories of beaches piled high with them, too many to carry to the car. I just wanted to find one. Floats had switched to the more durable and cheaper plastic. I’d just about given up ever finding my own when I was 19 and on the beach at Windermere with a friend from college. He’d just gotten to the island and I was showing him the beach. I pointed to a purplish hue up ahead and said, “Now those are man-o-wars–jellyfish–and they can sting even on the beach, so you want to avoid them.” As we got closer I saw it was a purple glass fishing ball. I grabbed it and hooped and hollered and did a little victory dance. My friend thought I was crazy but it was a moment I’ll never forget. Today I passed a little grass hut on the beach where I’d left my t-shirt the other day when it was raining. It stopped raining and I took off the shirt and tied it to a broken lounge chair and put a blue plastic float on it to weigh it down. I thought the blue float pretty and I thought about a friend whose mission it is to find blue floats on the beach. I guess she has a blue float collection or she’s found blue floats to be lucky. Who knows, but blue floats are her beach treasure. As I walked by the hut today I noticed that someone had removed the broken furniture. I idly wondered what had happened to the blue float, because it wasn’t there anymore either. As I walked maybe a 1/2 mile further, there, just brought in by the waves, was a blue float. They’re not really all that common. I picked it up and contemplated for a while whether I manifested the float by thinking about it. Nah… So I turned around and started the hike back. The sand was mushy because it was getting close to high tide. I was walking at the top of the beach and it was rough and slow going. I was almost back to the house and there, in front of me, was my second blue float of the day. That’s the magic of an Eleutheran beach walk. It is the best of so many worlds. It’s great exercise. It’s fulfilling to the senses. It’s rewarding for the mind. It’s the thrill of finding two blue floats with a focus that wasn’t there at the start of the walk. 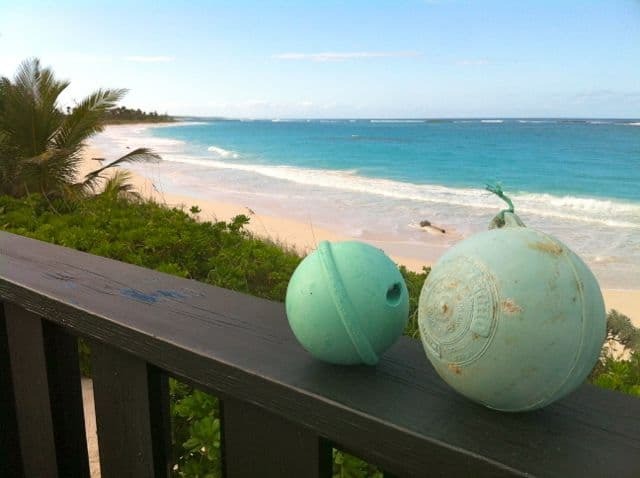 Thanks, Katie, for another great glimpse of Eleuthera – can’t wait to come back in the spring! What a coincidence. We are busy packing now for a 6 am flight to Cat. Haven’t been there in fifteen years. Want to check it out. Your lovely description of your walk has me so excited to walk in your shoes…(or bare feet). Will be heading to the island for Thanksgiving. Lobsters good friends and wine….can’t wait.. Sounds awesome. Going to Eleuthera for 1st time at Thanksgiving. Can’t wait! Thanks for a beautiful glimpse! I can’t wait! I’m leaving for your island on Nov. 14 and look forward to exploring!!! You write so beautifully about “our” island. I truly enjoyed each word. I’m on island now… will be here through the end of the month. Find it just a special as I remember it…too many years ago. Hope I bump into you! I was sitting here at my desk in Nassau — nerves frayed and feeling quite overwhelmed by the paper pile in front of me. I took a break and came across your recent blog which I had not read yet. We have a home in Eleuthera but do not get there often enough. So as I let your words soak in, I was transformed by the tranquility of a beach walk and the familiar sights you described. The scowl on my face has turned to a smile and all seems well with the world again! Wonderful to hear someone who feels the same way we do! Everyone always asks “why are you going back there again?? ?” They just don’t get it……we fell in love with the island way before we landed. No matter what the colors of the waters never cease to amaze me. Lack of restaurants, not a problem! Plenty of bakeries and homecooking to be found! Wish I could spend more time there, but am grateful for my two weeks.